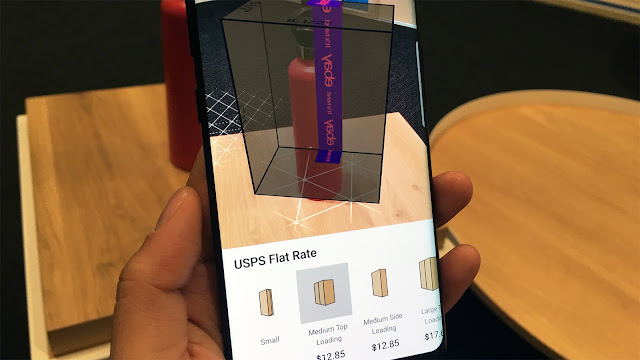 The eCommerce giant, eBay has launched an Augmented Reality (AR) tool that help its sellers figure out the best way to ship items to buyers; by auto recommending the correct USPS Flat Rate shipping box for their items. The technology works by helping the seller skip a trip to their local post office looking for the right-sized box, and also provide real-time calculation of shipping costs. It's perhaps the first practical use case for AR, and works with a wide range of products, including everything from kitchenware to automotive parts. It runs on Google’s new ARCore platform, which is currently available only on ARCore-enabled Android devices, like Google Pixel, Pixel XL, Pixel 2, Pixel 2 XL, Galaxy S8, S8+, Note8, S7 and S7 edge, LGE’s V30 and V30+ (Android Oreo only), ASUS Zenfone AR, OnePlus 5, among others. The AR feature also takes advantage of concurrent odometry and mapping to understand the phone’s position, and sensors for movement and orientation. It can be accessed from the eBay mobile app for Android; you'd need to open the app and tap “Selling” followed by “Which Box?” - the app will instruct you to place the item on a non-reflective flat surface, like a table or floor. Then you'd “try on” virtual boxes around the item, to see which one fits best – making room for extra padding if the item is fragile. You can change to the angle to look down on the box from the top, look on the sides and the back to see if the item is fitting all the way around using the box overlaid on the item. The AR shipping feature is only one of several new AR experiences eBay has in store, with an iOS version still in the works.